Bill Gates is an American business magnate, philanthropist, investor, computer programmer. In 1989, a 28 year old Microsoft executive named Melinda French caught the eye of Bill Gates, then 37. The very bright and organized Melinda was a perfect match for Gates. In time, their relationship grew as they discovered an intimate and intellectual connection. On January 1, 1994, Melinda and Bill were married in Hawaii. 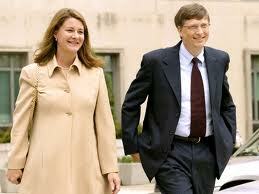 But only a few months later heartbreak struck Bill Gates as his mother was diagnosed with breast cancer. She died in June 1994. Gates was devastated.